After all the pastries, a girl has to take a break from desserts now and again, especially before – and after – all the festive dinners. 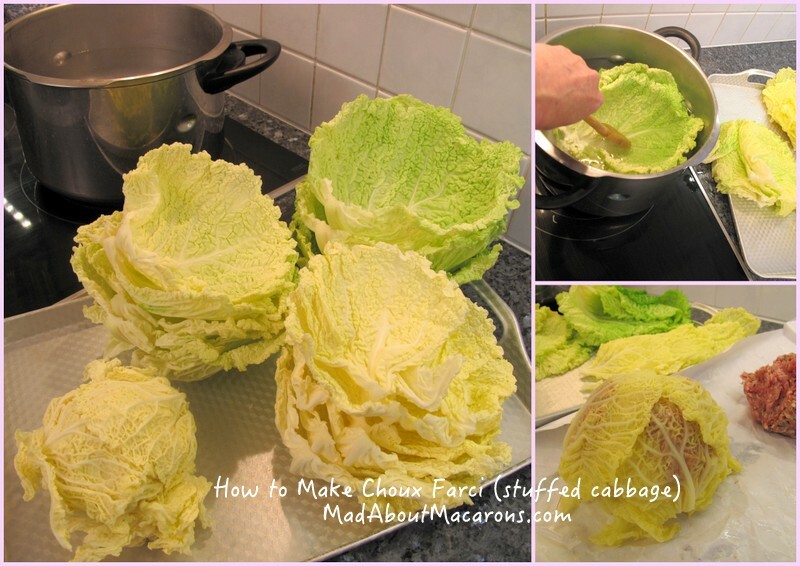 And I’m craving cabbage: stuffed cabbage! Ever since these perfectly round Savoys have been showing off at the market, Antoine suggested I make chou farci or stuffed cabbage, a rather splendid French classic. Rather than tell him to “get stuffed”, I welcome his ideas for dinner – but looking at a few classic recipes, I shied away from making it. It looked difficult and a right hassle: a perfect excuse to give it a go! As a lazy gourmet, I needed to cheat slightly with a normally long recipe. If you have been following le blog since the beginning, you may remember me talking about Monsieur Dee. 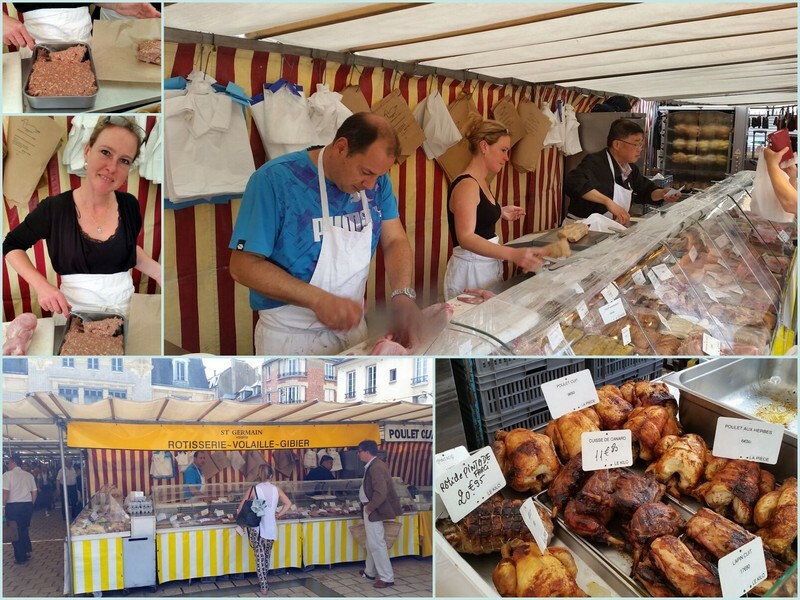 For the past few years, he and his charming colleagues have been serving their local clients with the best quality game and poultry at the farmers’ market in Saint Germain-en-Laye, just west of Paris. Update: for more on Saint-Germain-en-Laye, check out my introductory article on the Royal town, just outside Paris – and also a chocolate and pastry walk-about that I’ve composed for your next visit. La Patronne makes the most exquisite poultry stuffing which has a warming hint of quatre-épices (ground pepper, cloves, nutmeg and ginger), just perfect for this time of year. That was it – et violà! My excuse to cut down the recipe by half. And, as it normally uses pork and/or veal, a stuffing of poultry makes it that bit lighter to digest. Use your favourite turkey or vegetarian nutty stuffing or – if you can’t get a good quality stuffing sold separately – take off the skin of your favourite sausages. The secret to the recipe is to be organised with the leaves. It looks complicated but believe me, it isn’t as long as you think. Lay out each cabbage leaf in order of largest to the smallest (click on the photos in the recipe card below and you’ll see what I mean.) 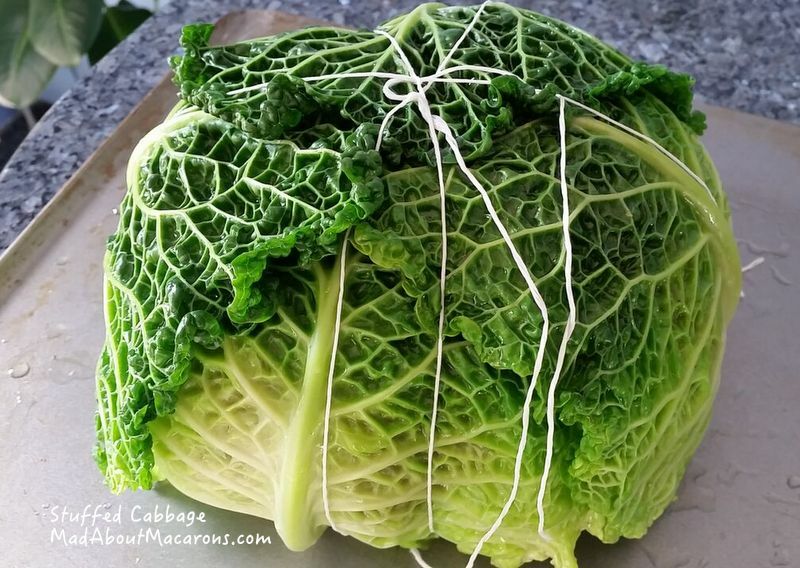 Cutting into the stuffed cabbage at the end is also easier than it appears: just cut off the string and using a large sharp knife, cut out each portion. Serve in large soup bowls and you’ll discover that this family dish could also be served to your guests too. We enjoyed it with a light and fruity Pinot Noir wine from Alsace. Cut off the first tough outside leaves and wash them thoroughly (some people discard them but I don’t like to waste). Cut off the bottom root. Remove all leaves, putting each of them together in order of size from each layer. This will make assembly so much quicker. Once you get to the inner yellow leaves, just leave them attached to the heart. In a large pot of salted boiling water, blanche the leaves for no more than a minute (I take each layer and do it say, 5 or 6 at a time) and remove with a slotted spoon. Blanche the cabbage heart for a minute and set aside. Starting with the smallest leaves first, spread (or press in with your fingers) just a little stuffing on to each leaf facing upwards. 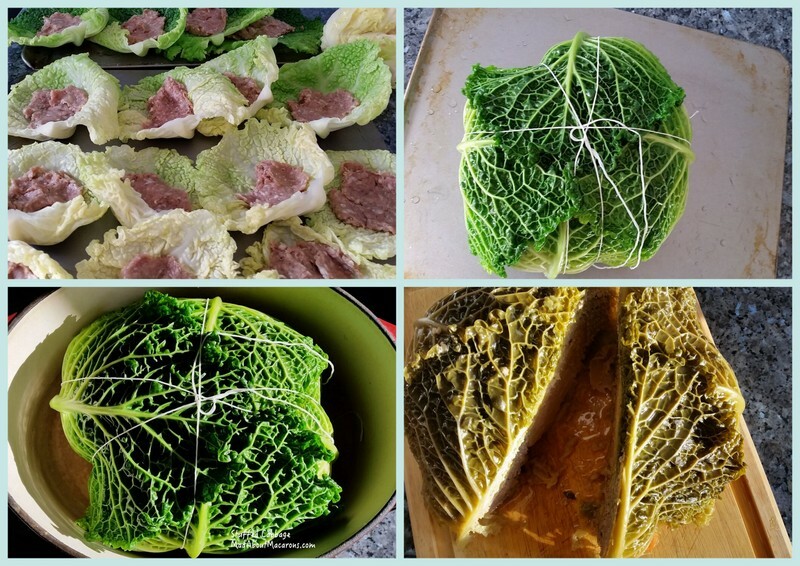 Gradually put the leaves back in place starting around the cabbage heart, sticking them around with the minced meat. Tie 3 pieces of string around to keep the cabbage round and in place. Peel and cut the carrots into small slices and place in a large crock pot with a lid. Top with the chicken stock, stuffed cabbage, garlic, herbs and season with salt and pepper. As soon as the stock starts to boil, turn down the heat to simmering, cover and cook for 1 hour 30 minutes. A couple of times during cooking, pour over the stock on top of the cabbage. Carefully remove the cabbage from the stock. On a solid cutting board that can catch the juices, remove the string and using a sharp knife, slice into 4-6 portions. Serve directly in soup bowls with the cabbage and stock. To make individual parcels (“paupiettes” in French) follow the recipe and in step 3, pile up 4 leaves, placing the stuffing on the top one, then roll up 4-6 leaves as such, tying each with string. Cook in the stock as in the recipe for 20-25 minutes. I’ve always wanted to make a stuffed cabbage. There was a recent French movie, that involved a chef going to the tundra, and there she made a stuffed cabbage. I think it was stuffed with salmon. Definitely on my list to make in 2016! Thanks Liz. Vive a light and tasty festive season! I go nuts for choucrout these cold days. 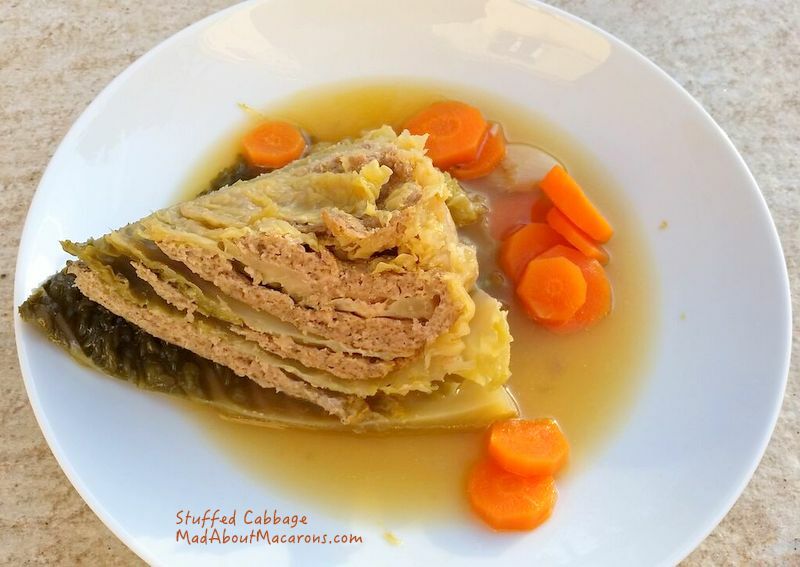 Carol – Choucroute and stuffed cabbage are two totally different things. One is fermented and this recipe is just cooked cabbage leaves (al dente) and stuffed. Ah, now I understand! I was wondering how you did this! I’ve made cabbage rolls before (each leaf stuffed with a mince, rice and mozzarella filling then topped with a tomato sauce and baked), but this is much simpler! You could actually add the tomato sauce and give this an Italian twist! 🙂 That photo of the cabbages is killing me! We never see such beautiful cabbages here, and I don’t know why. Wish you could send some over! Oh, I love the sound of your Italian version with individual leaves but yes, this would be great using this technique and adapting it to your recipe. Go for it, Christina! This looks delicious. A great after Christmas meal that would be light, satisfying and so good after the rich fare. Thanks Susan. Wishing you all the best for a wonderful Christmas too!